On this page we will learn MyBatis 3 CRUD operations with XML Mapper using MySQL step by step. CRUD is create, retrieve, update and delete data. MyBatis is an persistence framework that maps POJO and table for the data transaction. MyBatis is strong persistence framework to handle data transactions like hibernate. To start with MyBatis, we need to create a MyBatis configuration file which we need to keep in our classpath of project. This file is read by MyBatis first. Here we do database environment settings, XML Mapper configurations and many other as required. In XML Mapper we configure mapper namespace and queries like select , insert, update and delete with an id. We call these queries in our DAO using namespace and id. MyBatis reads configuration file using SqlSessionFactoryBuilder and returns SqlSessionFactory that creates SqlSession. Using MyBatis SqlSession, we perform select, insert, update and delete operations. Find the complete example for CRUD Operations using MyBatis. Find the required software to run MyBatis example. We have created a table for our CRUD operation. Find the Gradle file to resolve the JAR dependencies of MyBatis and MySQL. Find the POJO which we are using in our MyBatis demo project to map table and its columns. MyBatis configuration class has different elements. Find some of them. <configuration>: This is the root element for different configuration in MyBatis configuration file. <typeAliases>: Configures an alias for the POJO which will be used in XML Mapper. This is for our easiness not to use fully qualified class name in XML Mapper. <environment>: This element configures the database settings like driver name, username, password etc. <mappers>: Using this element we configure XML Mapper in MyBatis configuration file. We need to create a Mapper where we define our CRUD operation as SQL query. <mapper> : This is the root element of XML Mapper. <resultMap> : Using this element we map table column with POJO property. <select> : Configures select query. <insert> : Configures insert query. <update> : Configures update query. <delete> : Configures delete query. The namespace of mapper and id of select, insert etc element is used together to create statement to run query. Find XML Mapper which is being used in our example. The statement for select query will be com.concretepage.VillageMapper.selectVillage which will used in our DAO class. And in the same way statement can be created for insert, update and delete operation. Create a utility class that will provide a method to return SqlSessionFactory . 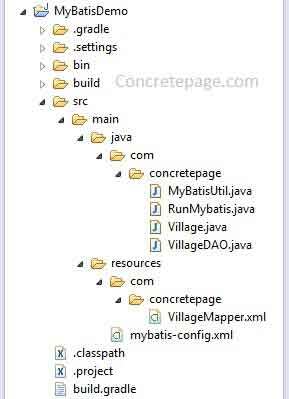 SqlSessionFactoryBuilder : Builds the MyBatis configuration file. SqlSessionFactory : Factory class to create SqlSession. Resources : MyBatis provides this class to access file. In our DAO class, we are creating methods for CRUD operation. MyBatis provides different API to handle it. SqlSession: MyBatis session to run queries. SqlSession.insert(): Executes insert statement for the given input object. SqlSession.update(): Executes update statement for the given input object. SqlSession.delete(): Executes delete statement for the given input object. SqlSession.selectOne(): Executes select statement for the given input object and returns POJO. Finally we will test our MyBatis application. I am done now. Happy Learning!.